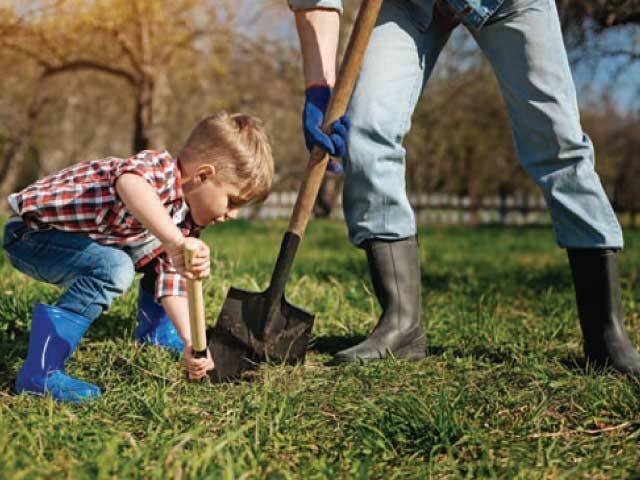 Plan Ahead To Dig Safely This Spring – Sangre de Cristo Electric Association, Inc.
Before picking up your shovel for your next outdoor digging project, take the necessary steps for safety or you just might dig up trouble or even tragedy. Although your projects may seem small, the impact of making contact with an underground utility line could be huge. Damaging underground utilities can be costly, dangerous and disruptive. To help you stay safe and prevent digging accidents, Safe Electricity shares tips on how to dig safely. The Common Ground Alliance estimates that there are 200 million miles, or 100 billion feet, of underground utilities in the United States. Some of these utilities are buried just a few inches below the ground. This means that small projects, such as planting a flower bed or installing a mailbox, should be surveyed before digging begins. “The key to safe digging is planning ahead,” explains Molly Hall, executive director of the Energy Education Council’s Safe Electricity program. Call 811 a few business days before your planned digging date. Once you have reported where you plan to dig and what type of work you will complete, the area will be surveyed and marked for public utilities within two to three days. This service is free of charge. If you have any private utilities, you need to hire a private utility locator. Some examples of private utilities include: underground sprinkler systems, invisible fences, data communication systems, private water systems, or gas piping to a garage. If you do not know what facilities are on the property, look for clues to tell you what might be under ground, like: a propane storage tank, gas meters, a detached garage or outbuilding with lights, a grill or pool on the property, manhole lids, storm drains, and pavement patches. Once all marks are made to indicate the location of underground utilities in the area, respect the boundaries, and dig carefully. Keep at least 24 inches away from the utility line markings. It can be helpful to excavate by hand when more control is needed to maintain this safe distance. If an area was previously tested, have it retested. Erosion and natural processes can lead to shifting in the lines. If you hit a line in the process of digging, report it, even if it appears to be undamaged. Small dents and microscopic damage can lead to major utility problems. Always wear gloves and other protective equipment while digging. Keep a first aid kit on hand. Stop work immediately if contact is made with an underground line. Your first priority should be evacuating the area for safety. Call 911 to notify emergency personnel and the affected utility. Even small nicks in underground lines can be expensive, but necessary to fix. If you believe it may be an electrical line that was damaged, warn those nearby that the ground and any nearby equipment may be energized. Individuals should take precautions to prevent becoming electricity’s path to ground by remaining still with both feet together. If the area must be evacuated, keep your feet together and hop to safety as you leave the area. Do not resume work until the area is confirmed safe by your electric utility. For more information about digging safety, visit Call811.com and SafeElectricity.org.